So, we had fun yesterday playing an antique (looks like late 1930's) Monopoly game (thanks Mikey), and drinking some rather stong whisky (thanks Daryl and Guy). Kev won! The game has original pieces and dice, but the dice were rather too worn to use. 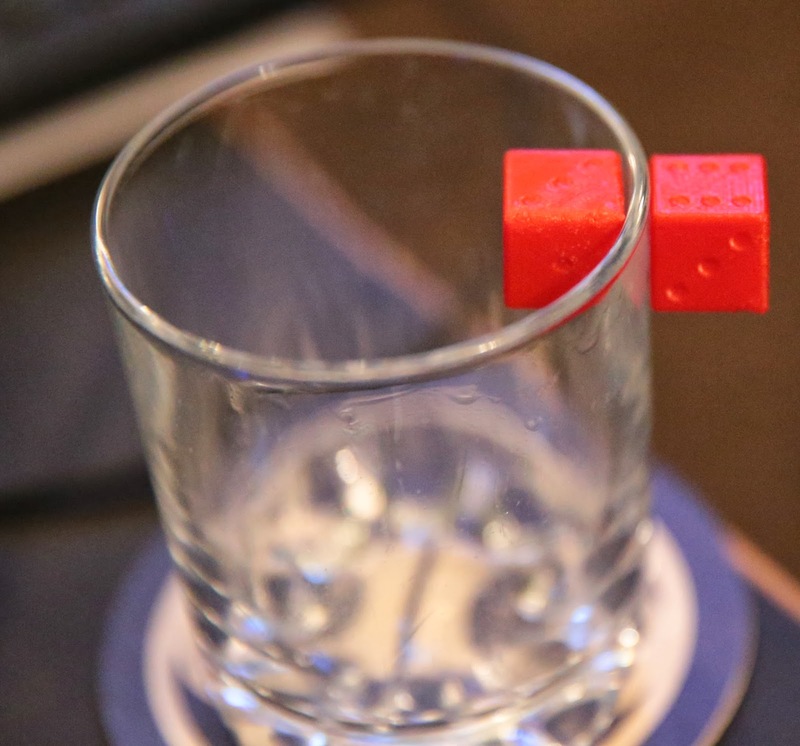 So I printed some dice on the 3D printer, as you do. 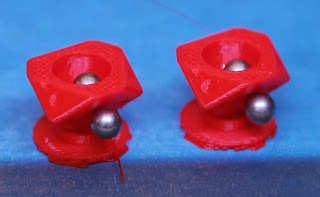 But then I thought I would have some fun - being a 3D printer you can do things that would not normally be very easy, such as including a spherical cavity in the centre of each die. I then dropped a smaller spherical magnet in to the cavity during printing. I had to put one on the outside to hold it in place. Continue printing, and now I have space dice! i.e. dice you could roll in space on to a metal plate and they would land and stick there. As the magnets are free to move there is no bias created. The problem is that they stick together, so not easy to use as a pair in a shaker. Fine if rolled separately. But fun, none the less. Anyway, for the game I did a pair of dice without magnets, but I did, for fun, put a small ball bearing in the centre cavity of each. This created a rather unexpected, and useful, effect. The dice worked perfectly for playing, using the shaker and rolling on the board, but they had one rather useful feature. They did not roll far. I do not think we once had dice go bouncing off in to the distance under someone's chair, as is normal in any such games. They did roll a bit if you tried, but generally they just landed and stopped. Obviously in such cases using a proper shaker is a good idea to avoid someone setting up the dice and just dropping them, but it was rather interesting. I'll probably find someone has patented the idea already. I also designed a set of loaded dice for fun. You read the review of the whisky! I'd read the review of thw whisky if I could find it, there's no link. Ah, OK, I have linked it now. Cask strength, great stuff for getting drunk. However the mention of fag packets in the smell really puts me off, I can think of very little that smells worse. Myself and a couple of friends (one visiting from Atlantic Canada) once drank an entire bottle of cask strength Laphroig between the three of us in one evening in Cambridge. I'm not sure I could manage it now. Yes, there were four of us to finish that bottle off during the game, but they were drinking beer and port and stuff and the odd small glass of whisky. It was basically me that was on the whisky so I probably had at least half a bottle. Ooops. Hmmm... dice with a "floating weight" - doesn't affect their fairness but slows them down a bit. Years ago, we used to play "Risk" - a game very prone to being messed up if dice went onto the board. My father set a rule - "on the board, or on the floor, is a 0" - I later refined this... on the board, a 1, on the floor, also a 1 unless verified by at least one opponent and a non-player before the player touches. If opponent touches before verified, a 6. Dice that stopped easily would have been really good for that game. Oh, and to make it better not to land them on the floor, verified dice count half value, rounded up.